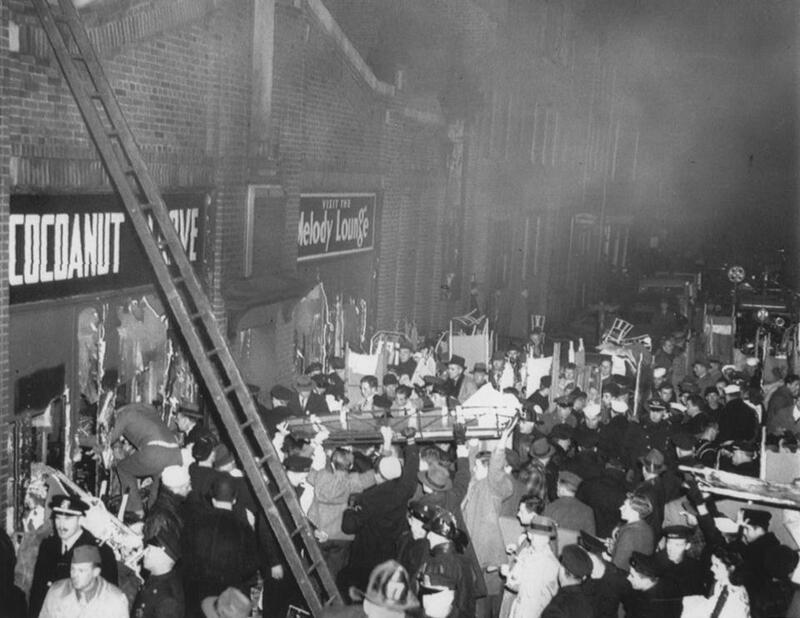 Police, firefighters, and volunteers removed bodies at the rear entrance to the Cocoanut Grove Night Club after the 1942 fire. Dorothy Doucette is not happy, and she has a right not to be happy. The modest, bronze plaque in question was created by her father, the late, great Tony Marra, the youngest survivor of the Cocoanut Grove fire of 1942, when 492 people died in a nightclub in Bay Village. Tony Marra was a 15-year-old busboy when he cheated death. They embedded the plaque in the sidewalk on Piedmont Street in 1993, with considerable reverence, to commemorate the deadliest disaster in the city’s history, to remember those who perished. The plaque places the Cocoanut Grove tragedy not just in its local context but far beyond. When someone bought the old parking lot on Piedmont so they could build eight luxury residences there, Tony Marra’s plaque was removed with the understanding that it would be returned to the same spot when construction was completed this year. But once the Piedmont Park Square condos were occupied, the new owners objected to the old plaque going back to its original spot in that nice, new, red brick sidewalk. But they complained that all that history was intruding on their privacy. At its May meeting, the neighborhood association agreed to move the plaque. It was relocated a couple of weeks ago to the next block, at the corner of Piedmont and Cocoanut Grove Lane, adjacent to the Revere Hotel garage. “It was a community decision,” said Sarah Herlihy, the president of the neighborhood association. But relatives of those who died and those who survived the disaster, supported by a group of people who have fought for greater recognition of the Cocoanut Grove fire as an integral part of the city’s history, are livid. Beyond disputing the idea that wreaths and prying eyes are such a problem, they say the plaque was specifically placed at the former spot of the nightclub’s revolving door, where so many people died in a frantic sprint for the exit. “The plaque was purposely put there because it’s a very meaningful location,” said Dr. Ken Marshall, whose mother was a nurse who worked four days straight taking care of Cocoanut Grove survivors. Herlihy claims the infamous revolving door was actually somewhere between where the plaque was originally placed and where it was moved a couple of weeks ago. But both former mayor Ray Flynn, who attended the original plaque unveiling, and former fire commissioner Paul Christian question that assertion. They also question whether the neighborhood association got the requisite approval from city agencies to move the plaque. Herlihy maintains the city acquiesced to the decision to move the plaque, citing the presence at the May meeting of Sam Chambers, Mayor Marty Walsh’s neighborhood liaison to the South End and Bay Village. But both Flynn and Christian suggest the city’s Public Improvement Commission needed to sign off on such a move. I sent e-mails and left voice messages for both Chambers and the Public Improvement Commission, but they did not respond. Christian says the real issue is a lack of sympathy for both the history and the relatives of those who died in the fire, not to mention the handful of survivors still alive. It does not mention that the condos were built on the doorstep of one of the biggest disasters in American history. Herlihy says that moving the plaque to the next block actually does history buffs a favor, because it gives them more room to congregate without invading someone else’s privacy. But one of her predecessors thinks the plaque belongs in its original spot. Ruth Knopf was president of the Bay Village Neighborhood Association in 1993 when the plaque was first placed in the sidewalk in front of 17 Piedmont St. by the neighborhood association. “My personal feeling is that when people move into a historic neighborhood, whether they can afford a $2 million condo or not, they need to respect what came before them,” Knopf said. Zach Graves-Miller, a filmmaker who is making a documentary about the Cocoanut Grove fire, was shocked to find the plaque had been moved. I spoke to one of those survivors the other day. His name is John Rizzo. He is 96 years old, lives in Lynn, and was a waiter at the Cocoanut Grove. He and Tony Marra escaped together through a cellar window and helped others to safety. He wasn’t happy about people messing with history, but felt powerless. “I’m too sick to do anything about it,” John Rizzo said. The contretemps in Bay Village over a small plaque raises a bigger point: It is time that the victims of the Cocoanut Grove fire are afforded a proper, large-scale memorial somewhere in the city. In fact, it is long overdue.